As VR games are continuing to evolve and one of the interesting developments is taking the more traditional 'flat' games and exploiting the way in which VR can improve the interface between the player and the game. Augmented Empire does this by creating a turn-based action adventure game that is guided by the player's head movements rather than a mouse pointer. This simple change draws the player in to the very dark and dispiriting world Augmented Empire is set in. All is not well on the island of New Savannah as those who have are very much separated from those who have not. During PAX West 2017 I managed to spend some time in this future where things are far from bright. Set in a dystopian future where a Citizen Grading System is in place, Augmented Empire has the player take on the role of six characters, all of whom have a vested interest in unseating the authorities that control New Savannah. They must employ every skill they have at their disposal to overcome seemingly impossible odds all in a very tactical and turn-based manner. In a similar vein to games like Final Fantasy Tactics and the Shining Force series, Augmented Empire is an RPG with a tactical combat system. It requires the player to execute commands that are optimum for the situation the player characters find themselves in. They must use cover and line of sight to their advantage so that they suffer the least amount of harm. 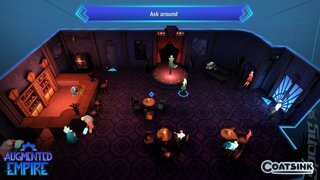 Augmented Empire shares much of the trappings of tactical RPGs with the major difference being that it has a VR interface and that the player's reaction time impacts the results of actions. The VR aspect places the player into a fixed view that floats over the tactical map of an area. Everything can be seen from this vantage point and the player simply has to point their head and select the spaces they want the player characters to move to and/or targets to shoot at. It's very intuitive and does speed up the rate at which combat is played out thanks to this simple use of VR. The reaction to incidents that impact on the player character or those they initiated is presented by a sliding vertical bar that runs from left to right along a wide horizontal bar that has a varying degree of brightness within it. The brighter section is where the travelling vertical bar needs to hit in order to have the maximum success. Anywhere outside of this bar can result in either a diminished effect or even failure. This is quite unusual for a tactical RPG and I thought it was a welcome addition as it adds an element of both risk and opportunity to the genre that is typically reduced to finding cover and/or attacking the flank of enemies. This is not the first time I have experienced Gear VR and it never ceases to amaze me how games like Augmented Empire can run so well on such a small device. I saw no stuttering or slowing down as I made my way through levels of enemies who were far too keen to see my player character cease to exist. The presentation of Augmented Empire is pretty impressive, as is the high quality voice acting from the likes of Kate Mulgrew, Nick Frost, Doug Cockle and Garrick Hagon, all of whom pitch in their vocal talents to make Augmented Empire a very special experience. 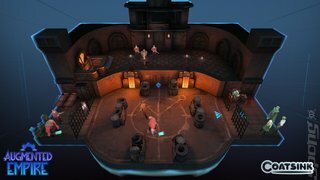 Augmented Empire is out now on Samsung Gear VR.